Little tip: I had a few air bubbles appear on the table surface. I used a sewing needle, poking a tiny hole in the air bubble. I smoothed it out and then applied more Mod Podge over top of it. Definitely helped! This weekend my little toddler and I planted our first vegetable garden together. She loves playing in her sandbox so I had no doubt she would love digging in the dirt. When I began digging, she grabbed her plastic shovel and pretended to dig. She was fascinated by the whole gardening process. I wanted to start out small. I did some hunting in our side yard and found some plastic fencing. It was enough to keep our little Bichon Frise at bay, as well as keeping Miss little legs from crushing the plants. I bought three plants, a tomato, cucumber and red pepper. (I know this will barely make a salad!) 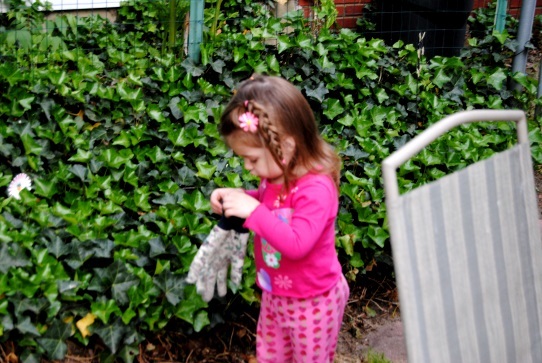 At little E’s age it is more the concept of a garden that is most important. 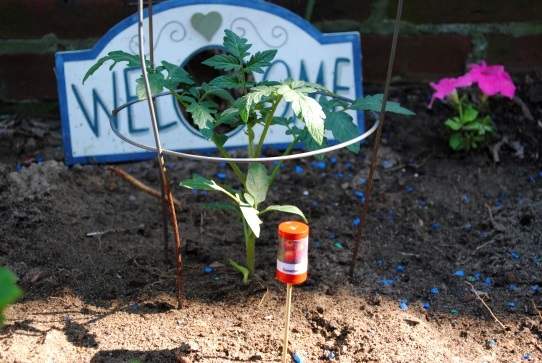 I have seen various tutorials on the internet on how to make garden markers. 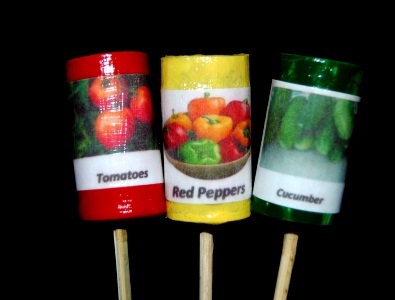 The spoon markers are adorable, and I loved the wine cork ideas. So, I am throwing my virtual hat in the ring and gave the idea a try. Here is my take on the wine cork markers. I painted each a different color with acrylic paint. I let dry. I found pics of veggies online and added text in word. I then printed out those vegetable images on photo paper. I used the contact sheet setting on my printer and this small photo size worked perfectly. I cut the pictures out and glued them to the corks with outdoor Mod Podge. I repeated this process several times coating the entire cork. One finished I inserted a bamboo skewer in the cork to anchor the markers into the ground. A cute little detail in the garden. Never hurts to add a little color! Welcome to our mini garden! What’s in the glove, Love? I was driving into work the other day and this crazy thought popped into my head. 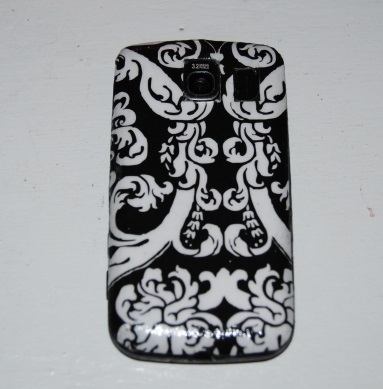 What if I could decoupage my smart phone? Sure it may seem like a strange and risky idea at first and If I had a super fancy expensive phone I may reconsider. I have an entry level phone so I felt I had nothing to lose. I had gone through about six different cell phone covers. 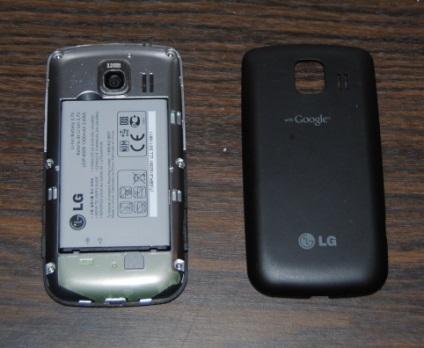 Many cases never correctly fit the phone and the others broke easily. I popped the back cover off and thought to myself I could do this! First, I tried using wrapping paper. It was a nice pattern I bought from the dollar store. It proved hard to work with because it was super thin and I scrapped that idea after a failed attempt left tears and wrinkles. 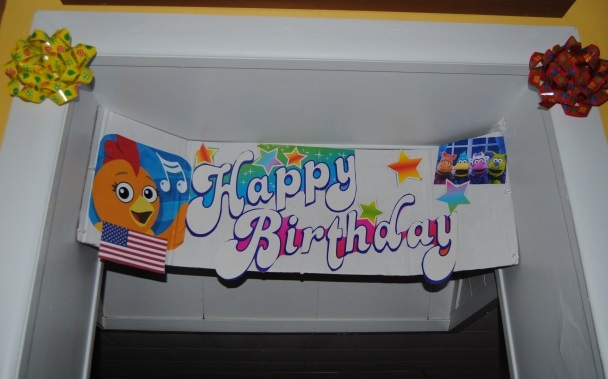 I used instead, scrapbook paper which is thicker and more durable. I traced the phone cover onto the paper making sure to trace the various openings on the phone. I used an x acto knife to cut the tracing, carefully cutting the openings for the camera and speaker on the phone. I used Mod Podge Matte finish to adhere the scrapbook paper to the phone cover smoothing out the edges. I then sealed the outside of the cover with seven layers of Mod Podge allowing each layer to dry thoroughly between applications. I was pleasantly surprised with the result! I had this piece for a while as I was not sure what I wanted to do with it. I picked it up at Goodwill for $2.99. 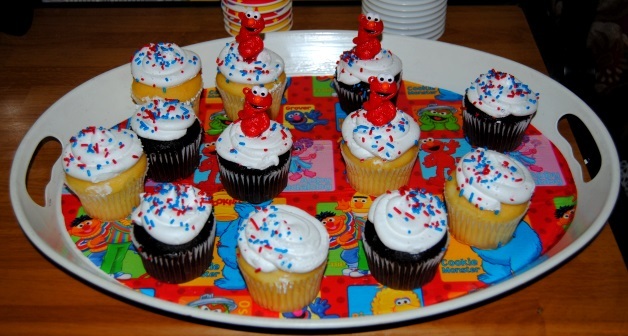 The last week has been focused mostly on my daugter’s birthday party. It was a nice smaller project for me. Most of this project was completed before she woke from her afternoon nap. 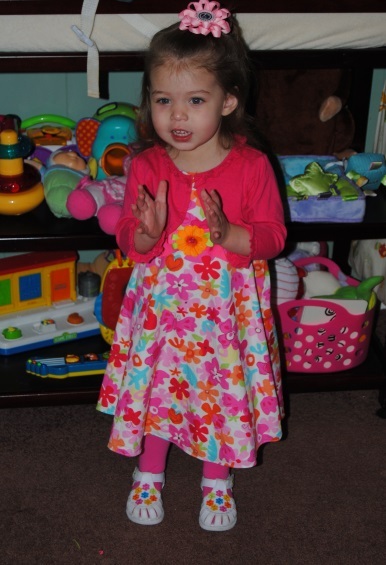 As my daughter gets older, she is accumulating quite a bit of jewelry, hair bows and other various adornments. I thought this box would be great because it consisted of three fairly deep drawers for storage. I wanted to make it girly and restyle it using a character that Erin loves. I chose Abby Cadabby from Sesame Street. I love the pink and purple colors that make up her character. I printed out some Abby images along with a nice purple and pink floral inspired background on photo paper. I removed the drawers. I had already primed this piece previously, so it was ready to paint. I painted the top surface dark purple and the sides pink with acrylic paint. I set aside and to dry. 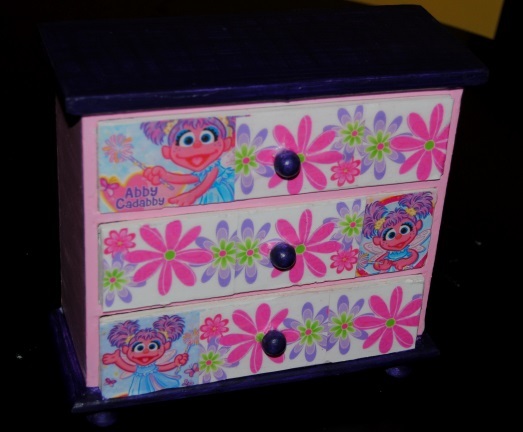 I cut out the Abby images first and glued them to the drawer using Mod Podge Matte Finish. 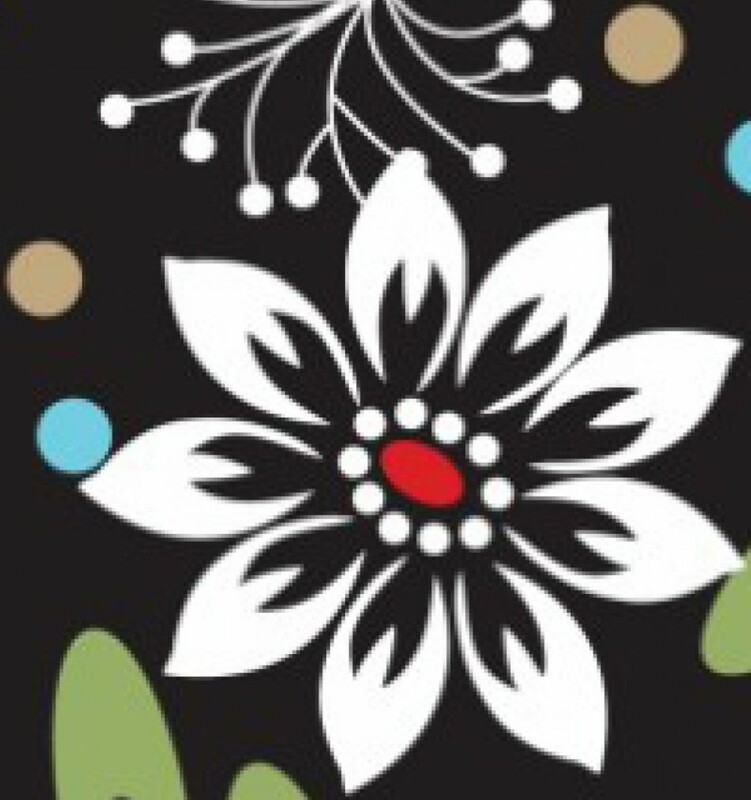 I then measured out the floral background. The biggest challenge was applying the paper around the knob. The knobs on the drawers did not appear removable so I lined it up with the paper and cut a small round hole carefully feeding the knob through. 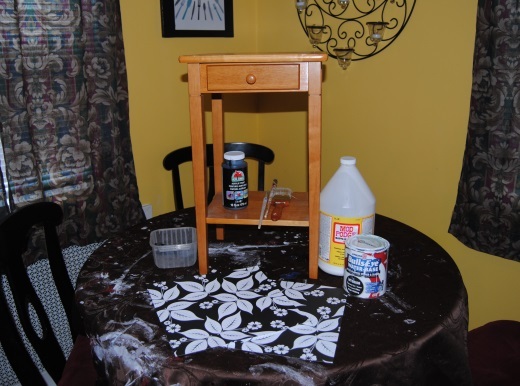 I then used a smaller paint brush and applied the Mod Podge to glue the paper down to the drawer surface. 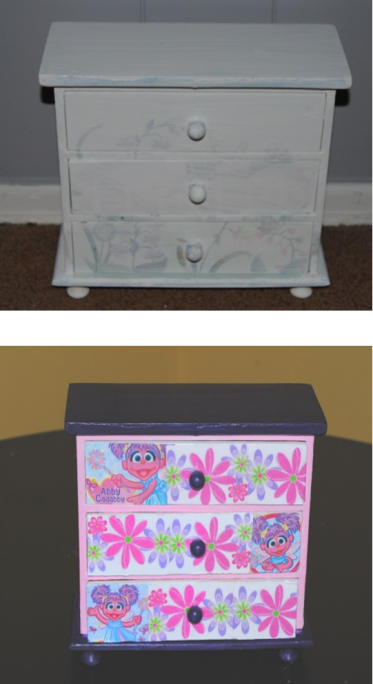 Once dry, I applied the Mod Podge generously over the drawer and photo surface and the painted jewelry box. This seals the entire piece. I used several coats to seal. Letting dry between coats. I usually sit them in front of a fan to speed up the drying process. The result is what you see here and I like overall how it turned out. For some reason when taking a picture it appears more blue than purple! 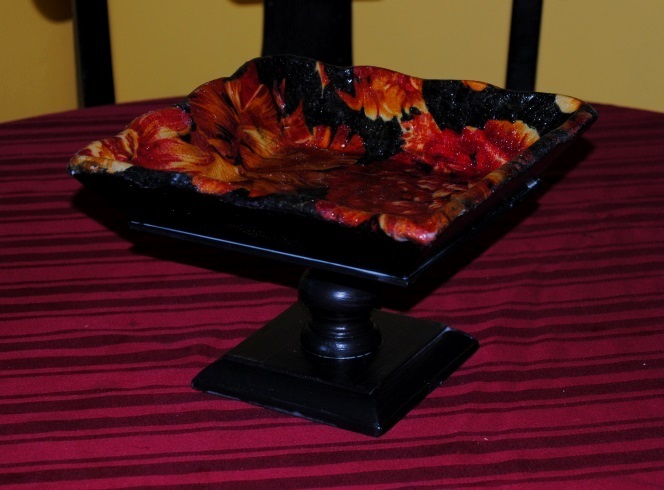 Recently I came across this great wooden pedestal bowl at a flea market. The first thing I noticed wasn’t the bowl. Their was a big cardboard sign stating “Everything on this table only a dollar!.” A buck seriously? 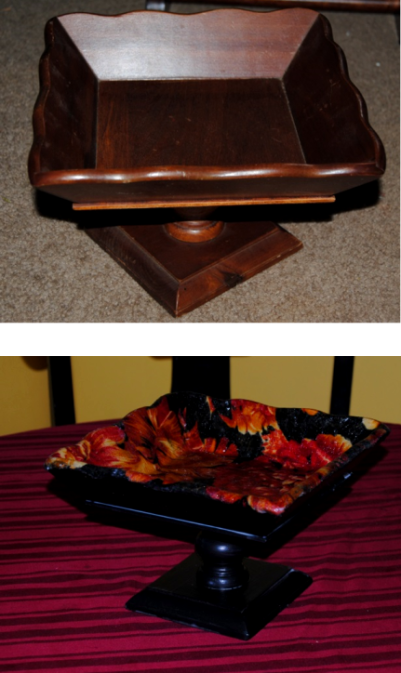 I have to admit most of the items on the table were junk, but the little wooden pedestal bowl caught my eye. I had nothing to lose! 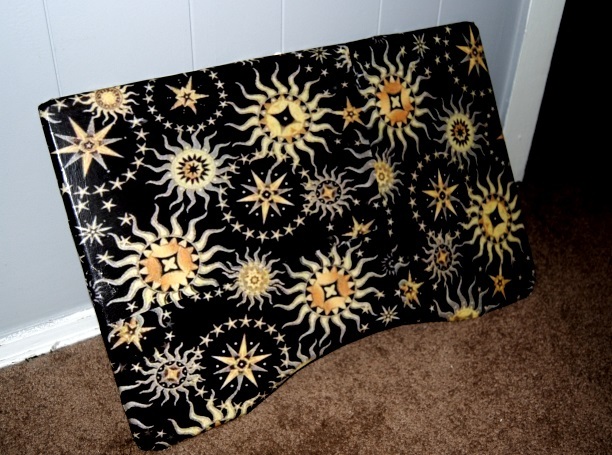 I had some of the scarf material left, I could use this to decoupage the inside. I had used this same material on a side table in a previous post. I had a vision when it came to this little bowl! First, I primed the bowl with a white latex primer. Once dry I used black acrylic paint and painted the entire piece. Next was the tricky part. I couldn’t measure the fabric for the inside surface of the bowl. Instead I took a larger piece of fabric than I needed and using Mod Podge glued it to the surface leaving the extra fabric to hang over the edges. Once dry I carefully trimmed the fabric and applied Mod Podge to the edges to mold it to the wood. 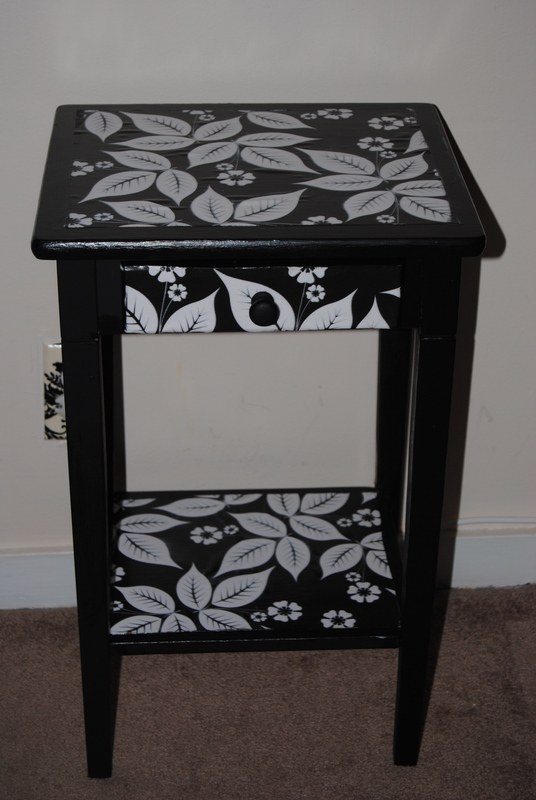 I then sealed it with four coats of Mod Podge applying it to the entire piece. I really liked how this turned out and will be sure to keep my eyes open for any wooden bowls that cross our path in the future! Their is nothing I love more than trolling around in our attic! I call it re-shopping. Before I go out and buy something new, I always check in our attic for items that have long been forgotten, stored away and are one step away from the trash can. 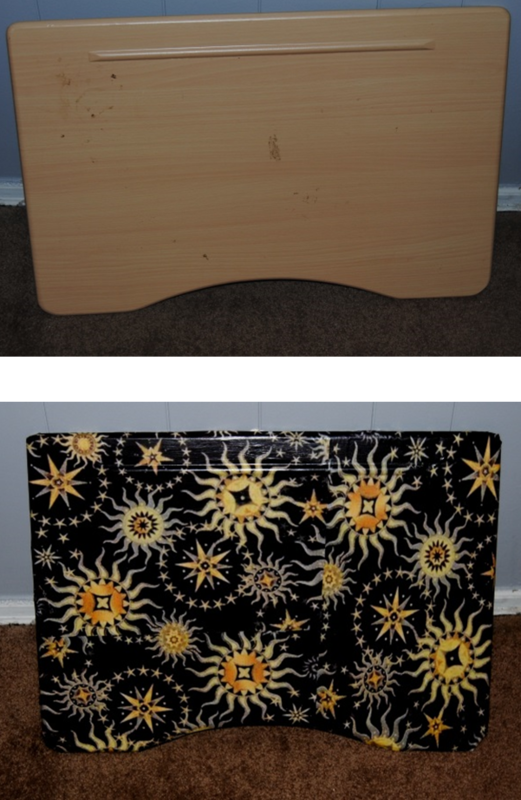 It was on this day that I came across an ugly old lap top desk. I find myself more often times than not, blogging from my bed on my laptop . This would be perfect, but boy was it an ugly eye sore! Mod Podge to the rescue! I had these cool celestial prints I had printed out and had no idea what to do with them! I like the pattern and thought I would tuck them away and use someday. I thought to myself someday is now! 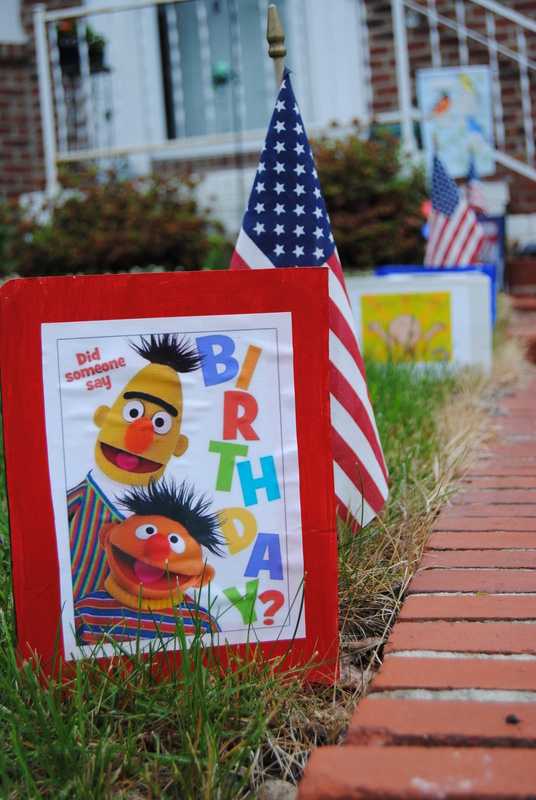 You can use wrapping paper, scrapbook paper, magazine cut outs, the possibilities are endless! It really depends on your personality! The biggest challenge with this project was the size of the laptop table surface. Matching up the design was a challenge as was gluing the paper to the curved edges of the surface. Otherwise this was a fairly simple project.